Besan ki katli is a chickpea flour savory cake that is shallow fried and then curried in a mustard gravy. 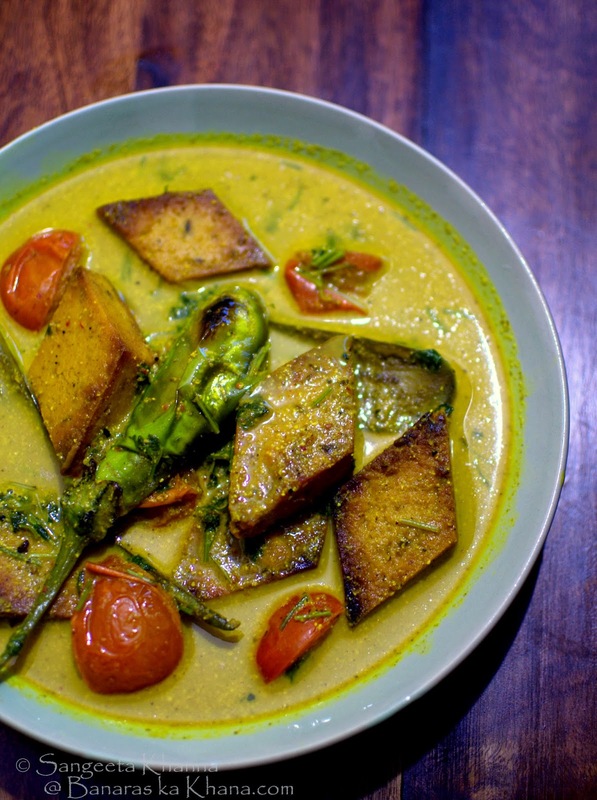 This besan ki katli curry is often called dhoka subzi as it masquerades as a fish curry for vegetarians, there is a Bengali version of this curry called Dhoka'r dalna which mean the same. The besan or chickpea flour cakes resemble fish steaks in appearance and have a meaty texture, hence a special dish for vegetarians during festivals or family get-togethers. This is one of my favorite vegetarian recipes too. The pungency of mustard is balanced well by tomatoes and generous helping of coriander greens and the chickpeas cakes absorb every bit of it. 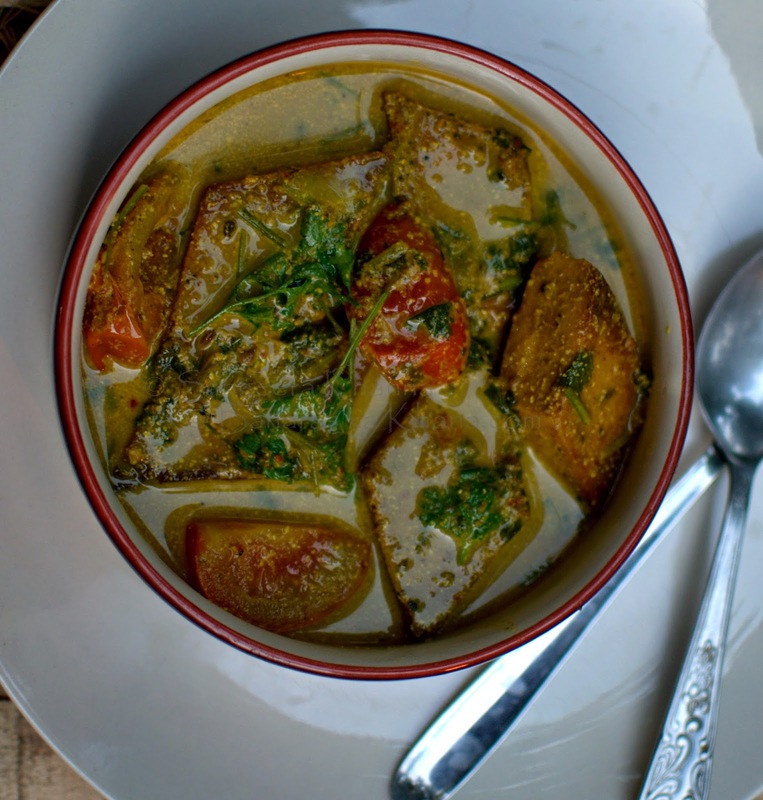 The bengali version of this curry, dhokar dalna is quite a yummy curry with a slight sweetness to it, but this curry is a UP version, eastern UP to be precise. I feel the curry is influenced by Bihar and Bengal with minor changes, only had got a bit more pungent, hot and sour in this version. But a really good balance of flavors as besan ki katli soaks up flavours of mustard and chillies etc magically. Mix everything together to make a batter. Pour it all into a non stick pan or an iron kadhai and start cooking while stirring the mixture continuously. The mixture thickens and dries up within 7-8 minutes of cooking and forms a lump. This the an indication of it being ready, remove the pan from the stove. Quickly grease a flat plate with oil and spread this mixture over the plate, patting it down using the spatula or a large flat knife. Spread it as thick as you like, make the edges smooth and let it cool down. Cut in diamond shapes when perfectly set. These diamond shaped chickpea flour cakes are called besan ki katli and will be shallow fried before currying. Shallow fry the katlis in a flat base frying pan, browning them lightly on both the sides. Reserve for currying or have them as a tea time snack if you wish. Soak the mustard seeds in a little water for 10 minutes and make a fine paste of it along with all the powdered spices and garlic in the mixer. Keep aside. Now heat oil in a pan and throw in the cumin and fenugreek seeds, let them both crackle a bit before pouring in the mustard paste into it. Add salt and cook stirring it all for 3-4 minutes or till the spices become aromatic. Add 1.5 cups of water, slip in the besan ki katlis and simmer for about 15-20 minutes. Add slit green chilies and quartered tomatoes in the last 5 minutes of simmering. Finish with coriander greens and serve with plain boiled rice and raita, kachumber salad etc. You can add brinjals or even shallow fried okra to the same curry to include some vegetables in it too. 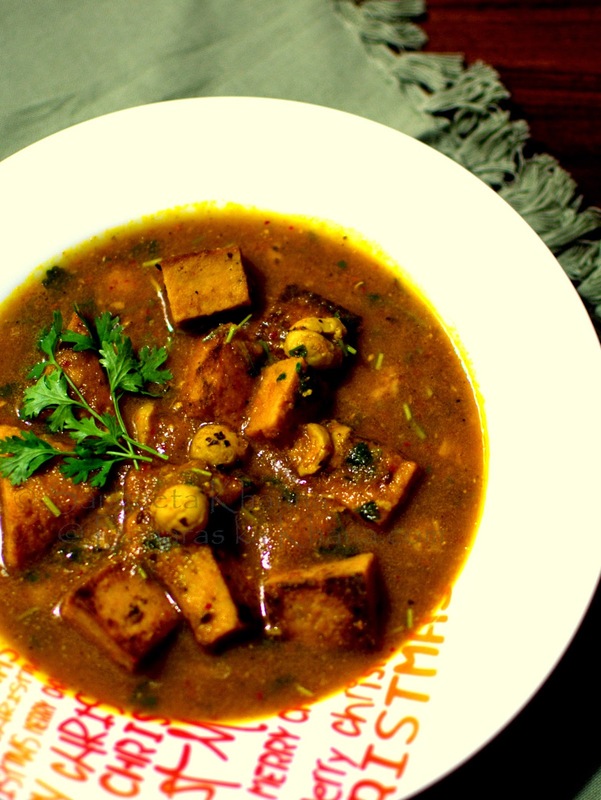 You can make a curry of the besan ki katli in a tamatar pyaz ka masala as well. I normally add a few makhana or green peas whenever I make besan ki katli subzi in tamatar pyaz ka bhuna masala. One made, the besan ki katli can be frozen in the steamed form and then can be thawed, shallow fried and curried whenever required. A healthy curry will be ready with minimal effort if you have bhuna masala in the freezer too. These katlis can be added to kadhi as well. But they usually don't last long once you make them. Most of it gets over in snacking with chai. This looks great, will try it out soon. Thanks for the recipe.